Dr. Rowe received his Bachelors of Science as well as his Masters of Science at the University of New Hampshire. Here he received a Masters in nutritional sciences and cellular physiology, graduating with a 4.0 average. His research group was one of the first in the country to characterize an in vitro brain micro-vessel endothelial layer, an important first step in understanding the passage of nutrients across the blood brain barrier. Dr. Rowe went to Albany Medical College and graduated in the top of his class. During this time he also performed a research fellowship in Regensburg, Germany. Here the research lab was characterizing a novel way to increase the level of dopamine in brain cells in order to treat diseases such as Parkinson’s. Following medical school, Dr. Rowe went to the Medical College of Wisconsin for Plastic Surgery Residency. After six years he came to Case Western University to complete a facial aesthetic surgery fellowship. Following graduation of residency and aesthetic fellowship, Dr. Rowe has worked in the Cleveland area. He has won multiple awards including the University Hospital Case Western Reserve Residency teaching award twice. Nationally he has served on multiple committees including the American Society of Aesthetic Plastic Surgery Light and Energy Based Therapies Committee, The American Society Of Plastic Surgery Emerging Trends Committee and Clinical Trials Network Committee. He is also a reviewer for several peer reviewed journals in Plastic Surgery and Dermatology. 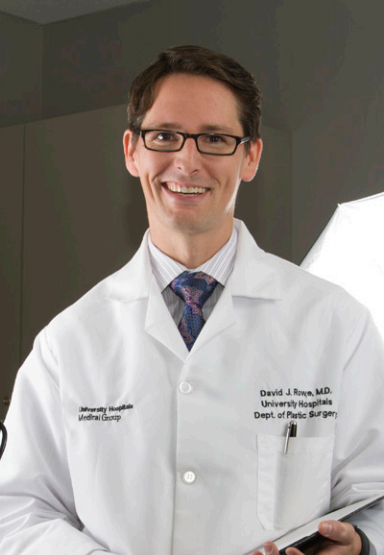 See Dr. Rowe in the Press!